Boston Celtics – There is no question that Boston remains the class of not just the Eastern Conference but of the NBA. They will be able to handle the loss of James Posey and PJ Brown, thanks to the continued growth of Leon Powe and Glen Davis. Beyond that, you know Kevin Garnett will keep Boston hungry. Detroit Pistons – A new voice on the sideline could help this team, which has a nice combination of youth and experience. The development of Amir Johnson, Rodney Stuckey, and Jason Maxiell will determine how far they can go this year. 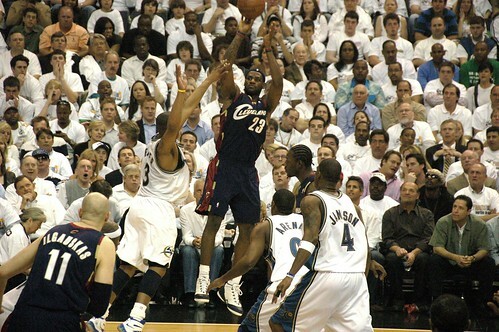 Cleveland Cavaliers – I love the addition of Mo Williams at point guard, along with their depth. Many people seem to be overlooking the Cavs this year, which is probably just fine with LeBron and company. Philadelphia 76ers – I have already written about how much I love Philly this year. Their energy, depth, and the addition of Elton Brand make them a 50 win team. Toronto Raptors – If Jermaine O’Neal is re-energized from the trade the Raptors are going to be awfully tough to stop up front. Jose Calderon is a rising star at point guard. Orlando Magic – If Mickael Pietrus can match his raw talent to his production, they could a 2-3 seed. Atlanta Hawks – They made a spirited run at the Celtics last year, giving them confidence that they can compete with the best in the East. Their front line of Marvin Williams, Josh Smith, and Al Horford could be scary good this year, nevermind they still have Joe Johnson at 2-guard. New Jersey Nets – Everyone is down on New Jersey this year, but a motivated Vince Carter in the backcourt with Devin Harris will be tough to stop. They will go as far as their front court takes them, meaning Yi Jianlian, Brook Lopez, and Sean Williams need to develop quickly. Miami Heat – I am ready for Dwayne Wade to become a beast again, nevermind the pair of forwards he has to work with. The point guard situation is a little scary, however. Washington Wizards – They were a playoff team last year, despite Gilbert Arenas being hurt, why can’t they do it again? If Andray Blatche can step up at center, expect to see the playoffs again in DC. Milwaukee Bucks – Richard Jefferson and Michael Redd are a nice 1-2 scoring duo. Whether or not the Bucks make the playoffs, depends on the play of Charlie Villanueva and Andrew Bogut down low. Chicago Bulls – They certainly have the talent on paper to be a playoff team in the East, but then again everybody thought they were a title contender last year and look how that turned out. Indiana Pacers – They actually were in the mix for the 8 seed last year, yet I don’t think they did anything in the off-season that makes them any better than they were last year. Yes that means I don’t think TJ Ford makes that big of difference. Charlotte Bobcats – I don’t think Larry Brown is making them anywhere near a playoff team this year. They need their big men to stay healthy in order to compete. New York Knicks – I am a Knicks fan and I would be happy with 30-32 wins.